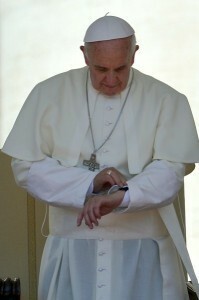 We haven’t had a PopeWatch open thread in a while. The usual open thread rules apply. Be concise, be charitable and, above all, be amusing. Jordan Peterson/ Sam Harris in London: Man uses 9% of his brain. Therefore, 91 % of the atheist’s brain is worshiping and acknowledging almighty God. The atheist exists. God exists. Penumbras of enumerated and un-enumerated human rights are innate. The penumbra, the umbrella, of un-enumerated rights, human rights and civil rights in our Founding Principles; our Constitution and our Declaration of Independence, are the innate human rights endowed by “their Creator” (Declaration) to the sovereign person at the beginning of his existence. The penumbra of un-enumerated innate human rights must by their very nature include all rights, enumerated and un-enumerated. Innate human rights do not contradict one or the other. “What God has joined together, let no man put asunder” starts with the sovereignty of the human person in his penumbra of innate human rights. Innate human rights become our civil rights when the sovereign person is given birth and becomes a citizen. Innate human rights are unalienable, infused by an infinite “Creator” who can only endow unalienable, innate human rights. Therefore, innate and unalienable human rights endowed by our “Creator” may be enumerated and un-enumerated in our Founding Principles. Innate, unalienable, un-enumerated, human rights become our civil rights at the birth of the sovereign person into citizenship. Sovereign personhood defines the perimeters of un-enumerated human rights in the legal term “penumbra”. The violation of our Constitution is not God’s will. The violation of our Constitution is the work of the devil. May almighty God have mercy on our immortal soul. P.S. To the taxpayers of The United States: The devil is getting expensive. I am not a lawyer or a legal scholar. I am not particularly well-read. But, here goes! Take it for what it’s worth. Seen elsewhere, “Anne Applebaum calls it the “rejection of Democracy.” Appointed-for-life judges, not elected legislators, gave America abortion/murder, gay privileges, etc. Judges choose sides. They name and empower winners and the punish losers. IMHO that is not interpreting the Constitution. the cousin to this site for those traditionalist believers in the old school united states military is called,,,,,,,,u.s. defense watch,,,,,,where the abominations of the liberalized if not rose red commie influence is manifest everyday,in our feminized u.s. military,,,,,the layout is quite similary with comments open to reasonable observers,,you do not have to be a veteran to comment …….catholics have the pope,,,,veterans have the defense sec and the joint chiefs that are allowing the us military to become a bizarre social experiment in gender neutrality. just google,,,u.s. defense watch…… that is all.